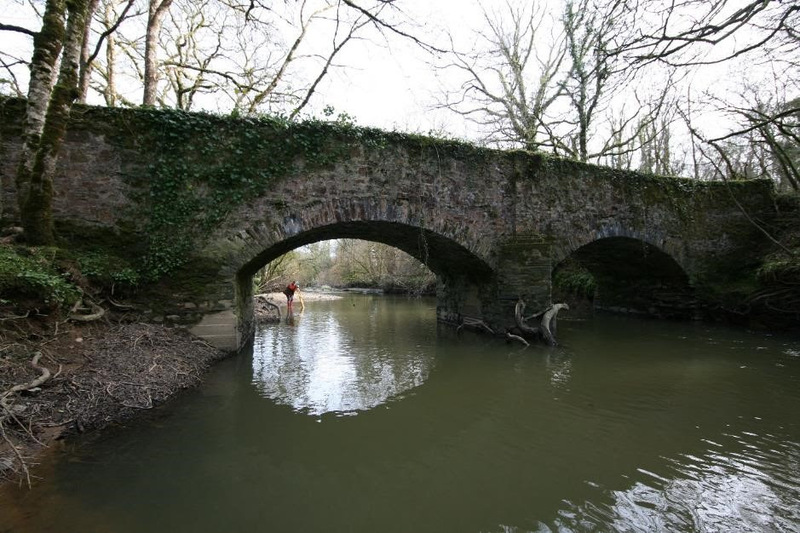 This month we look at a small private bridge across the Tamar in North Devon and Cornwall. Bridge of the Month is published as an email newsletter. You can subscribe to receive future editions by email. We won't give your email address to anyone else and you can unsubscribe at any time. As usual, this Bridge of the Month is available as a PDF for those who prefer to read on paper. 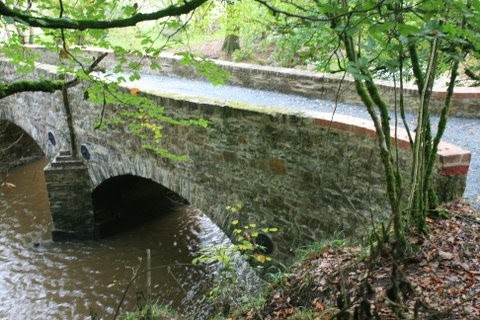 I was reminded last week that I have never done a BoM on the little bridge at Tetcott in North West Devon. It was a fascinating job, made all the better by having some great people to work with. Mike Dart, the farmer was central. Various people at Natural England but particularly Rob Dixon had a hand in providing funding. The pivotal work input from South West Highways was invaluable. That was managed by Steve Guilbert. They were brought in through the good offices of Kevin Dentith at Devon County Council. Eastcott wood is visible on google maps but the bridge itself is hidden in the trees. It sits in the corner between the wood and the river, just to the south of the wood. The river is the Tamar, here in its upper reaches and quite volatile. The area is a haven for wildlife, there are not many bridge jobs where you can encounter an otter in your daily work. The bridge began in what we can only describe as a parlous state. It is privately owned and had been long neglected by the estate. Generations of farmers had made makeshift repairs to the worst of the damage but entropy was winning, without a doubt. Note, amongst other things, that the upstream cutwater is so high. There has been a bridge here for a long time. The first major expense recorded was 1842 but it was not enough to build from scratch so perhaps this was originally a 2 span wooden bridge on a central pier. Even at the scale of these photographs, some damage is visible. 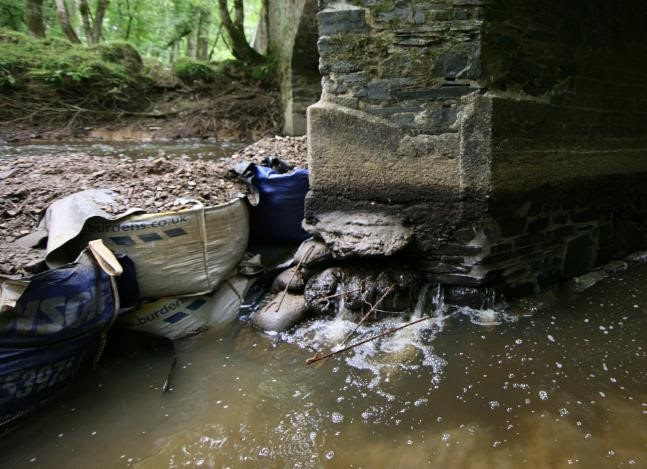 Note for example the many concrete patches in the lower levels of the pier and abutments. The damage done by untended vegetation is of particular interest to me. This is the point of maximum concern. The picture is taken with a very wide angle lens, 14mm on a full frame 35mm camera. 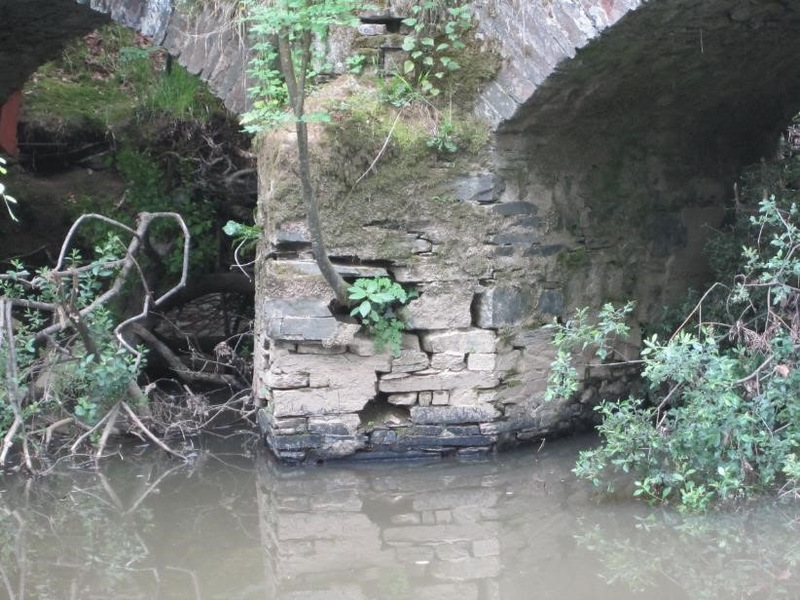 The result takes in the West abutment and beyond the crown to about the mid-river third point from B to C, the mortar is almost entirely gone and there is some loss of stone. In the moss covered area the mortar is sound and apparently complete, as it is at the crown. This suggest to me that water is penetrating from above and coming through preferentially at the point where the arch extrados meets a solid backing. There is similar loss of mortar at the other quarter point just out of the top of the picture. The real alarm is the crack that runs from top right of the picture, through the crown and the open zone. 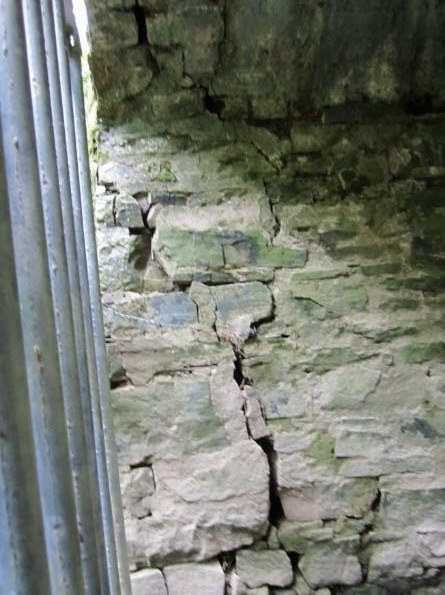 Closer inspection shows that it then continues through mortar and stone to the edge of the support at the abutment. In the other direction there is a crack down to and partly through the pier. 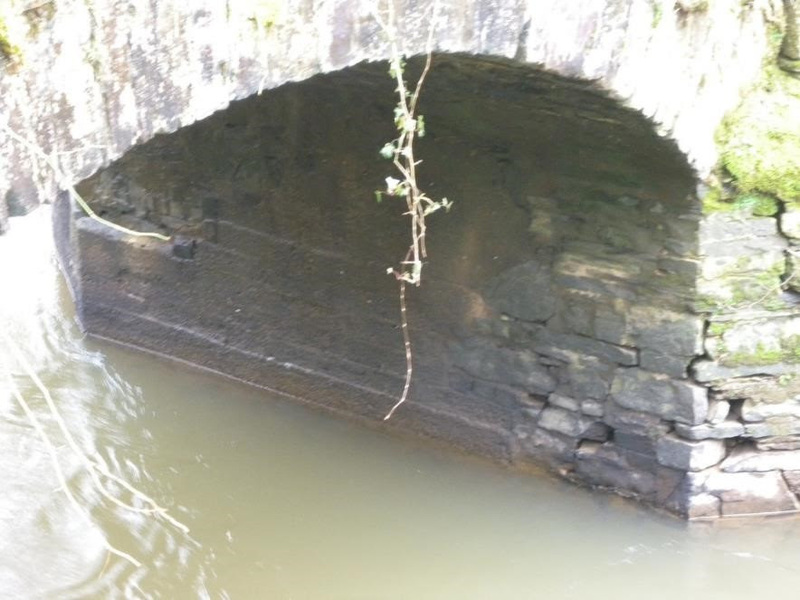 Like the abutment, the pier is missing support over a considerable width. I took the view that the whole section was inadequately supported. We therefore set about designing a simple frame to redirect the thrust at the west end and it was installed before any other work was permitted. The frame was designed to be fitted without going under the bridge and applied a clamping force of 10 tonnes to the side of the ring, thus turning the thrust through 45 degrees. 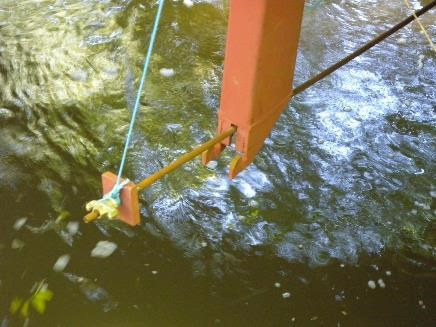 Figure 18 Bottom tie lifted in. I will not make the claim that it worked. It was no more than a precaution. Interesting, though, some months later to be introduced to the work of the French engineer Pitrou who published a drawing of a very similar treatment undertaken in the early 18thC. And so to treatment. A team of divers packed beneath the pier with bags of concrete and rebuilt the corner of the abutment. Unfortunately, they didn’t do it well. Once South West Highways started work themselves, progress and the quality of the work were impressive. They partially dammed the river with dumpy bags containing local fill.